The reason came as a surprise. Initially, the researchers hypothesized the shank3 mutation somehow damaged the fish’s enteric nervous system — the “brain” that controls the gut — but that was perfectly normal. Instead, the researchers found the shank3 mutants had drastically fewer serotonin-producing cells than their wild-type counterparts. 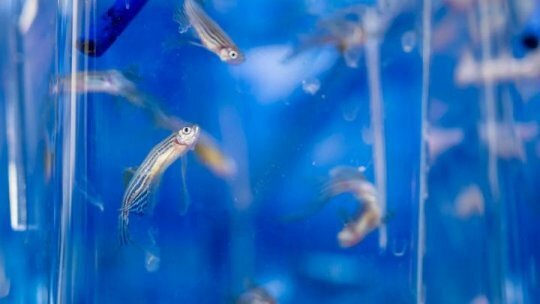 The study, “Intestinal dysmotility in a zebrafish (Danio rerio) shank3a;shank3b mutant model of autism,” was supported by grants from the National Institutes of Health’s National Institute of Mental Health and Eunice Kennedy Shriver National Institute for Child Health and Human Development. In addition to Dallman, James, and Kozol, the coauthors include Yuji Kajiwara, of the Seaver Autism Center for Research and Treatmentat the Icahn School of Medicine at Mount Sinai, New York; Adam L. Wahl and Emily C. Storrs, UM undergraduates; Joseph D. Buxbaum, also of the Seaver Autism Center; Mason Klein, associate professor in UM’s Department of Physics; and Baharak Moshiree, of the University of North Carolina’s Division of Gastroenterology.